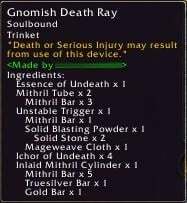 This AddOn displays ingredients (and subingredients) of crafted items in the tooltip. It was written to help with professions that require crafting subcomponents in order to craft a big item. SomeAssemblyRequired will learn recipes and their ingredients from your tradeskill windows. Depending on lag, you may need to open your tradeskill windows a few times, but after that SomeAssemblyRequired will remember all your characters' recipes. Ingredient information will be added to tooltips, unless the Control button is held (in case the tooltip goes off the screen when ingredients are expanded). Also, recipes from a tradeskill can be forcible re-learned by holding Control when you open a tradeskill window, in case recipe ingredients change in a patch. This will change whether SomeAssemblyRequired will show ingredients in tooltips. This will set the number of levels of subingredients that will be shown. Set to 1 to only show basic ingredients. The default is 10, which should show all ingredients for most items. Ingredients that have subingredients beyond the current display level will be indicated in the tooltip. This will toggle whether subtotals are shown after subingredients of items that you need more than one of. This is helpful for items that require multiple subingredients that you need to assemble. This will toggle whether a summary of all required ingredients is shown after the ingredient tree. This is very helpful for creating complicated items from scratch with the base ingredients. This will reset SomeAssemblyRequired's database of recipes and ingredients. * Checked mod for compatibility with Wrath of the Lich King beta. * Added check for recipes that create multiple items. Now their tooltips will display as "Ingredients to make 5:" and so on. * Removed support for myAddOns. * Added support for LinkWrangler AddOn tooltips. * Added ability to force relearning all recipes in a tradeskill by holding Control when opening the tradeskill window. This is useful since in 2.1 some recipes had the ingredient costs adjusted or reduced. * Fixed recognition of some transmutes, like Arcanite Bar and Primal Might. * Added knothide leathers to types of leather that won't have subingredients displayed. * Converted tooltip functionality to use new OnTooltipSetItem function, for efficiency. 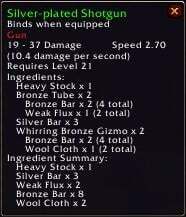 * Updated Fizzwidget tooltip library for compatibility with WoW 2.0.1. * Updated Fizzwidget tooltip library for compatibility with WoW 2.0. * Added code update for compatibility with future versions of WoW. * Limited display of leather type subingredients, so 1 Rugged Leather doesn't appear to need 2160 Ruined Leather Scraps! * Added new options to display subingredient subtotals and an ingredient summary. Note that these options default to off if you are updating SAR, to enable type /sar subotals and /sar summary. * Updated Fizzwidget tooltip library to add additional tooltip modifications. * Updated tooltip detection to work with many more types of tooltips! Special thanks go to Gazmik Fizzwidget's wonderful tooltip library (fizzwidget.com, used with permission). * Tooltip ingredient listing should now work in the tradeskill window, auction house, clicked-on item links, quest window, and more! * Added support for myAddOns 2.4 AddOn control panel. Anyone knows about a replacement for this addon? I wanted to post here that this Some Assembly Required is not currently being updated. It should still work overall (probably until Cataclysm changes a lot of things). Unfortunately I have not been playing WoW as regularly and I do not have the time to update my AddOns. Is there a way to either prevent certain professions or just certain items like enchanting or the small prismatic shard to large or vice versa from going into the list? If you do have specific item names that would be great. I have an engineer I will try to copy to the beta server. All of these are in relation to Engineering, if you need specific item names, please let me know. *SAR doesn't display any info for some items. *SAR doesn't show the Ingredient Summary on all items when enabled. *When the ingredient level is set to 10, it doesn't break down how many fel iron it takes to made x amount of fel iron bars. I also noticed you do have the modifier for temporary turn off, which I guess works, so ignore that part of my last comment, though the separate tooltip would still be nice. Thank you for keeping this addon up. It's a great addition to crafters who have long mat lists to keep up with. That's not a bad idea, I know when I mouseover my Alchemist's Stone, the tooltip kind of explodes. I'll try to add that in for the next version. As some items take many mats/submats, could you add a way to either only show the tooltip if a modifier is used (shift,ctrl,alt) and/or put the mats in a separate tooltip so the tooltip is easier to read when other mods also use the main tooltip. Yes, it doesn't get any enchanting recipes, because Blizzard uses a different UI for that. It's on my list to fix but I don't have an enchanter. Regarding built-in recipes, part of the motivation for this project was to get ingredient lists without having to download and process recipe data, so I probably will not be adding them. But what you can do is use the mod on any character with the tradeskill/recipes you're interested in (or even have a friend do it). Scan the tradeskill, log out, and then copy the saved variables file to your account, and you will have the recipes. Would it be possible to get an import of default trainer learned items at a minimum? I don't have an alch/bs/eng but still have to look up required items for those things when I need them made because I don't have them available in the craft window. Also, for enchanting, it isn't tracking oils for required items. I switched the method I used to modify tooltips in 1.7. It is now more efficient but may work with fewer customized tooltips. Feel free to revert back to 1.6, as there have only been minor fixes since then. Now if you could get this working on the recipe icons in the trainer frame, that would be the icing on the cake. If by "trainer frame" you mean the Tradeskill window (the window you craft items from), then the latest version did add this. If you instead mean the window you get at the skill trainer, I don't think that would work since trainers don't show you the actual recipes; only the names of the recipes you can learn. Now if you could get this working on the recipe icons in the trainer frame, that would be the icing on the cake. I had a mod to do that, but the day after I got it there was a major patch and it broke, never to work again since.